* 7 minutes walk from "Nihon Odori" station on Minato Mirai line. 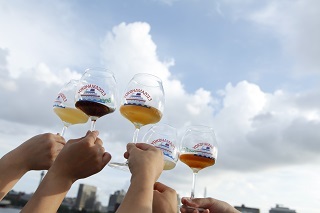 * A ticket includes entrance fee for 1 person and 1 best aroma glass for tasting. round and ONLY valid on the day and hours printed on the ticket. After ticket purchase, no changes, no refunds. your ID/proof of age by our security guards or receptionists. strictly prohibited by the hall. Foods are sold inside. be served less (25ml). One serving per trip to the beer serving counter. Please do not bring glasses for other people and expect them to be filled. * First 500 visitors(First 200 visitors on 9/15) can get the "Best Aroma Glass"
"Best Aroma Glass" with normal design. * The last call for beer and food is 15 minutes before closure. your purchase. We will not sell door tickets in case of full in advance. ONLY valid on the day and hours printed on the ticket. 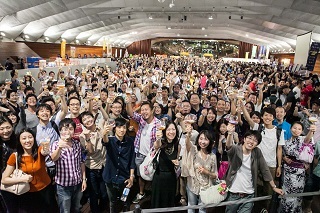 ※(7/14)Advance Tickets for the Eve of the opening are sold out. * The handling fee or shipping fee will be charged separately in some cases. 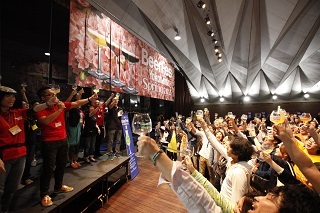 - The BeerFes is an event for beer tasting. Minors (under 20 : including a minor with a legal guardian) are not allowed. You may be asked to show your ID/proof of age by our security guards or receptionists. - Drinking any amount and driving is illegal in Japan. We suggest in the strongest terms, not to come via car, bike or bicycle. We will not be responsible for any accidents caused by drinking and driving. - Please be aware that advance tickets and day-of tickets are for the specified< round and ONLY valid on the day and hours printed on the ticket. After ticket purchase, no changes, no refunds. - The last call for beer and food is 15 minutes before closure. - Please understand that bringing in food or drink except a bottled water is strictly prohibited by the hall. Foods are sold inside. - There are no coin operated lockers inside the hall. Please use one of these at a nearby station. - This festival is a stand-up event and no chairs are prepared. Please do not sit or lie on the floor. If you do, you will be roused by security and may be asked to leave. Chairs will be brought in for visitors with disabilities or legitimate needs upon request. 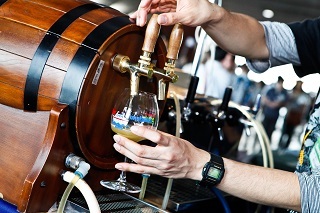 - To maximize the aroma for beer tasting, beers are served up to the "KEEP HEAD/BEER" (50ml) line on the tasting glass. Some strong beers may be served less (25ml). One serving per trip to the beer serving counter. Please do not bring glasses for other people and expect them to be filled. - Those deemed heavily intoxicated, causing a nuisance or engaged in risky behavior may be asked to leave. Dink responsibly. - Any publicity or solicitation activity in this event without permission is prohibited. - There is no smoking area inside the hall to enjoy the aroma of beers. - You can bring your drinking glass home. You must drink all of the beer in the glass before leaving the hall. If you no longer want your glass, please return it to the staff at the exit. 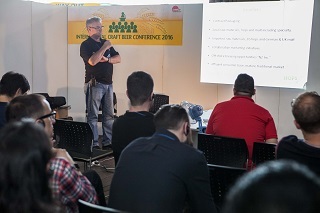 - Please understand that some popular beers may run out before the event ends. - Please enjoy beers with the "Best Aroma Glass" which you can get at the reception. If you break one, please inform a nearby staff member to clean the floor. There will be no replacement glass available, but you can ask for a plastic cup instead at the information desk. - We prepare a chair for handicapped visitors. - You can enjoy the event in your wheelchairs or with your guide dogs, service dogs, or hearing dogs. Please refrain from bringing other pets to the event or leaving them at reception. - Our staff will assist you if you feel a sick. - Please follow the instructions of security guards or staff if any disaster such as an earthquake occurs. In case of an earthquake, we ask you to gather at the center of the hall first. Upon confirming safety outside, you will be guided to a nearby shelter outside the hall. 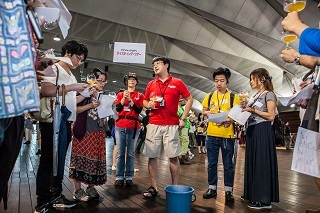 "Great Japan Beer Festival" which is known as "BeerFes" has being held every year in Tokyo from 1998, in Osaka from 2003, in Yokohama from 2006, in Nagoya from 2011 and in Okinawa from 2014. 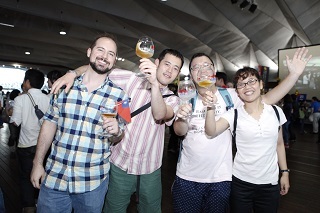 It is known widely and become the largest beer festival in Japan. You can experience a diversity of beers and learn about "Beer Styles" by tasting many beers to compare the difference of aromas and flavors. 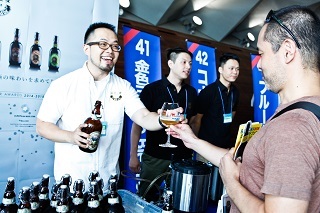 Another feature of this festival is that you can taste award winning beers such as the "Asia Beer Cup" (est.1998 *You can taste at BeerFes Tokyo, Osaka and Nagoya) and the "International Beer Cup" (est. 1996 *You can taste at BeerFes Yokohama in September). 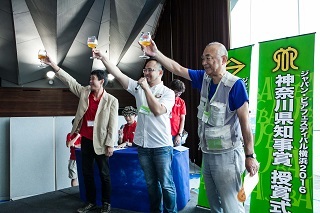 The "International Beer Cup" is one of the most famous beer competition in the world and the award (gold, silver and bronze in 106 beer styles) winners are decided from more than 500 beers. * 7 minutes walk from "Nihon Odori"
station on Minato Mirai line. Copyright (c) 1994〜2018 The Craft Beer Association all rights reserved.